I don't usually order exhibition catalogues because some can be quite boring. But anything with Calvin and Hobbes is something you should examine more closely. 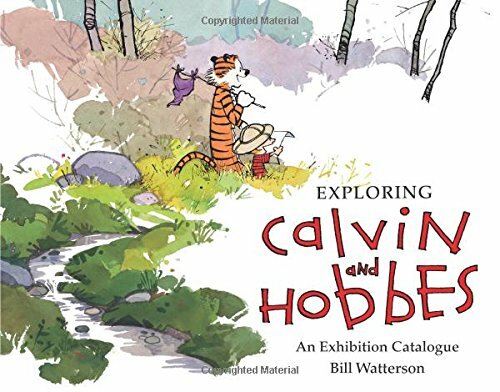 Exploring Calvin and Hobbes is the catalogue for the exhibition that ran at the Billy Ireland Cartoon Library & Museum from 22 March to 3 August 2014. The exhibition was curated by Jenny E. Robb. That's the only second exhibition devoted to Calvin and Hobbes since the comic strip ended in 1995. I remember the good old days of reading the comic strips on newspaper. Some newspapers nowadays still reprint them which I think is great because the magic is still there. The highlight of the book is the 35-page lengthy interview with Bill Watterson. Watterson if you don't already know doesn't like giving interviews or deal with media so it's quite amazing to have him open up. The Q&A style interview covers his career before Calvin and Hobbes, his influences, his process, thoughts about the comic strips, the characters, stories, newspaper syndication, why he doesn't like to talk with media and his views on licensing. For those who want to learn more about this amazing cartoonist, this book is highly recommended. In addition to the interviews, the book also separates the comics into different themes to look at, such as storytelling devices, the format of Sunday cartoons, characters, the parents of Calvin, the environment and home setting. That follows the presentation of the exhibition. There are selected comic strips and accompanying descriptions. It certainly gives me a new way to look at the cartoons. You'll want to get The Complete Calvin and Hobbes to enjoy every comic strip that was published. Overall, this is a nice exhibition catalogue. It's 160-pages, large format and not too expensive. So it's a good deal for the money. This book is also available in Kindle format. I would probably recommend the Kindle format if you're interested mostly in the interview.